SQL Database: It includes the relational databases which are designed in a tabular form and contain schema. For example: Oracle, MS SQL Server, Sybase, etc. NoSQL Database: NoSQL databases are self-describing so, they don't require a schema. They don't follow the tabular structure either. For example: MongoDB, Redis, Casandra etc. 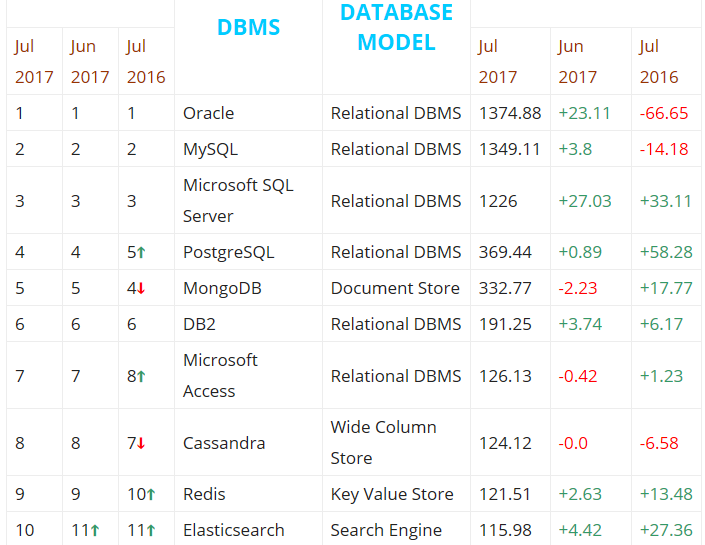 Here, we are providing a list of top 10 databases along with their advantages and disadvantages. We hope that it will help you to choose the right database for your application and for your career also. It is the most popular database in the world and very famous among developers. It has well written documents, amazing new features like JSON from SQL and very easy to use. Oracle database offers a wide range of features to help customers fulfill their requirements in the areas of performance, scalability, high availability, security, data warehousing etc. Oracle is developed by Oracle Corporation. It is written in Assembly language C, C++ and Java. Oracle NoSQL database is used to handle big data. It supports SQL and it can be accessed from Oracle relational databases. It is a distributed database. Oracle NoSQL Database uses Java/C API to read and write data. It provides access to the data through the node for the requested key. Oracle is based on PL/SQL programming construct. Its peer to peer communities help to solve problems. It is a very secure database and ensures that user data is not tampered with through prompt updates. It requires high cost for small organizations. It takes a lot of space. It requires lot of resources for installation. MySQL is an open-source relational database management system which is free under the terms of the GNU General Public License. MySQL can run on Linux, Windows, OSX and FreeBSD and Solaris. MySQL is open-source and customizable which helps programmers to modify the MySQL software to fit their own specific environments. MySQL supports large databases, up to 50 million rows or more in a table. The default file size limit for a table is 4GB, but you can increase this. MySQL is scalable, highly secure and open-source. MySQL is developed by Oracle and easy to use. MySQL is fast and supports Novel Clusters Services. MySQL can run on many operating systems. MySQL supports large databases, up to 50 million rows or more in a table. It is open-source and free to use. It implements a variety of user interfaces. It provides no built-in support for XML or OLAP. It takes a lot of time and effort to create incremental backups. MS SQL Server is a relational database management system built for the basic function of storing retrieving data as required by other applications. It was developed by Microsoft and initially launched in 1989. SQL Server is written in C, C++, and now widely used among major companies. MS SQL Server is the most widely used commercial DBMS. SQL Server supports SQL language which is an IBM product, non-procedural, common database, and case-insensitive language. MS SQL Server is platform dependent, high performance database. It facilitates you to install different versions in one machine. It generates script for data movement. MS SQL Server supports SQL language and separate security privileges. It can reduce temporary database problem. MS SQL Server is ideal for only large organizations. Integration Services issue to import files. PostgreSQL is pronounced as post-gress-QL. It is an open-source relational database management system developed by a worldwide team of volunteers. PostgreSQL was developed at Berkeley Computer Science Department, University of California. Companies who use PostgreSQL as their database: Apple, Cisco, Fujitsu, Skype, and IMDb etc. PostgreSQL provides support for tablespaces, as well as for stored procedures, joins, views, triggers, etc. It provides multi-version concurrency control (MVCC). PostgreSQL is a scalable database and provides predefined functions and a number of interfaces. PostgreSQL provides less mature replication software. Its configuration may be confusing. MongoDB is a cross-platform, document-oriented database which provides high performance, high availability, and easy scalability. It is a type of NoSQL database. It is the most popular NoSQL database. MongoDB provides a flexible structure which can be easily modified and extended rather than an SQL database. A schema can be written without downtime. MongoDB provides high performance and Auto-sharding. MongoDB can run over multiple servers. In MongoDB, data is stored in the form of JSON style documents. It has an automatic load balancing configuration because of data placed in shards. It supports regular expression searches. MongoDB is easy to administer in the case of failures. MongoDB is easy to setup and install. MongoDB is a schema-less, high speed database. MongoDB supports ad-hoc query and its performance is very high. It is a horizontally scalable database. MongoDB Inc. provides professional support to its clients. Its data size is high. In MongoDB, nesting of documents is limited. It increases unnecessary usage of memory. DB2 is a database developed by IBM. It is designed to store, analyze and retrieve the data efficiently. DB2 supports the relational model, but in recent years some products have been extended to support object-relational features and non-relational structures like JSON and XML. DB2 Express-C is the latest version of DB2 which is not permitted for use in high availability environments such as involving replication, active-passive, or shared disk clustering. DB2 has different server editions which are designed for specific tasks. Its AESE / ESE version is designed for mid-size to large-size business organizations. Its WSE version is designed for workgroup or mid-size business organizations. Its Express -C version provides all the capabilities of DB2 at zero charge. It can run on any physical or virtual systems with any size of configuration. Its developer edition offers single application development. It is useful to design, build and prototype the applications for deployment on any of the IBM server. You can run multiple jobs at a time using Task Scheduler. It supports both SQL and NoSQL data models. It can be hosted from the cloud or a physical server or both at the same time. It is highly costly to be maintained for small organization. Its basic support is only available for three years. Microsoft Access is a database developed by Microsoft. It combines the relational Microsoft Jet database Engine with a graphical user interface and software development tools. Microsoft Access stores all database tables, queries, forms, reports, macros, and modules in the Access Jet database as a single file. It provides rich solutions with advanced data manipulation and user control. Import and export of data to many formats(Excel, Outlook, ASCII, dBase, Paradox, FoxPro, SQL Server and Oracle). It supports Jet Database format. It is a finite database. It is difficult to incorporate multimedia data. Time-critical transactions are difficult in this database. Cassandra is a distributed database developed by Apache. It is highly scalable and designed to manage very large amount of structured data. It is highly available NoSQL alternative of MongoDB. Cassandra is a highly scalable database. It is a NoSQL alternative of MongoDB. It is very popular database in banking, finance and logging. It was developed at Facebook for inbox search. It provides a quick response time. It supports ACID properties i.e. Atomicity, Consistency, Isolation, and Durability. It supports MapReduce with Apache Hadoop. It provides maximal flexibility to distribute the data. It has a Peer-to-peer architecture. It is highly robust and doesn't have a single point of failure. It is integrated tightly with other JVM based applications. It is more suitable for multiple data-center deployments, redundancy, failover and disaster recovery. Cassandra provides limited support for aggregations. It doesn't support ad-hoc query. Redis is an open source, in-memory data structure store which is used as a database, cache and message broker. It supports data structures such as strings, hashes, lists, sets, sorted sets with range queries, bitmaps, hyperloglogs, geospatial indexes with radius queries and streams. It is used to build high performance, scalable web applications. It holds its database entirely in the memory that's why it is very fast. It replicates data to any number of slaves. Redis supports a large variety of datatypes. It has clients in all the popular programming languages. It is an extremely fast database (perform about 110000 SETs per second, about 81000 GETs per second). It provides multi utility tools which can be used in a number of use cases. You must have knowledge of Lua for stored procedures. In Master-Slave architecture in Redis, there will be only one Master with multiple slaves for replication. ElasticSearch is a search engine based on the Lucene library. It is a real-time, distributed and open-source full-text search and analytics engine. It provides a distributed, multitenant-capable full-text search engine with an HTTP web interface and schema-free JSON documents. Elasticsearch is the very popular enterprise search engines, which is currently being used by many big organizations like Wikipedia, The Guardian, StackOverflow, GitHub etc. It allows a user to create replicas of their indexes and shards. It is scalable up to petabytes of structured and unstructured data. It can power extremely fast searches. ElasticSearch is an open-source, highly distributable, highly scalable search engine based on Lucene. It is Java-based and designed to operate in real-time. It can search and index document files in diverse formats. It provides lot of search options. It is document oriented with a higher performance result. ElasticSearch should not be used as a primary persistence store. So, you need to have another store for actual persistence. ElasticSearch has some Garbage collection issues. It doesn't support multi language. It doesn't follow ACID property completely.